>>> What can I do with an Outdoor Cinema? >>> What different Outdoor Cinema packages are available to choose from? >>> What do I get with each Outdoor Cinema package? 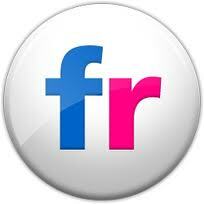 >>> Who performs the installation of the equipment? What can I do with an Outdoor Cinema? Live Sporting events & TV: When it’s time for the big game and you’re throwing a big party, then you need a BIG screen to go along with it. Our Inflatable Screens can be wired to your cable/satellite box so now you and all of your friends can watch the Superbowl, the NBA playoffs or the season premiere of your favourite TV show on the big screen. Anniversaries and Parties: Celebrating an anniversary soon? Then a slideshow highlighting the years gone by is a great way to celebrate. You can also use our Inflatable Screens to show off your latest holiday psictures or even something as simple as inviting the family over and showing off the new grandkids. Graduation parties, birthdays – perfect for any occasion. Exhibitions, Trade Shows & Advertising: Bigger is better. If you want to draw attention to something then put it up on a huge Inflatable Screen for the world to see. Advertise your products and let your customers see the great deals they can get or highlight a special item you want to sell. Weddings: Our huge movie screens are great for taking a trip down memory lane with the loving couple. Capture everyone guests attention by screening some pictures and home movie clips of the bride and groom when they were kids, when they met in college, holiday spent together etc. NOW PLAYING IN A BACKYARD NEAR YOU!!! What different Outdoor Cinema packages are available to choose from? So don’t forget even though our most popular option for our customers is to watch big screen movies, we will always be happy to help you connect any media you wish. All we ask is that you tell us in advance what you are intending to use the screen for so that we can ensure that the correct cables and adapters are available. Our standard package includes an Inflatable Screen (size chosen by the customer), Outdoor Speakers, DVD player and Projector. All you need to do is decide what size screen you want and let us know what you want to use it for. 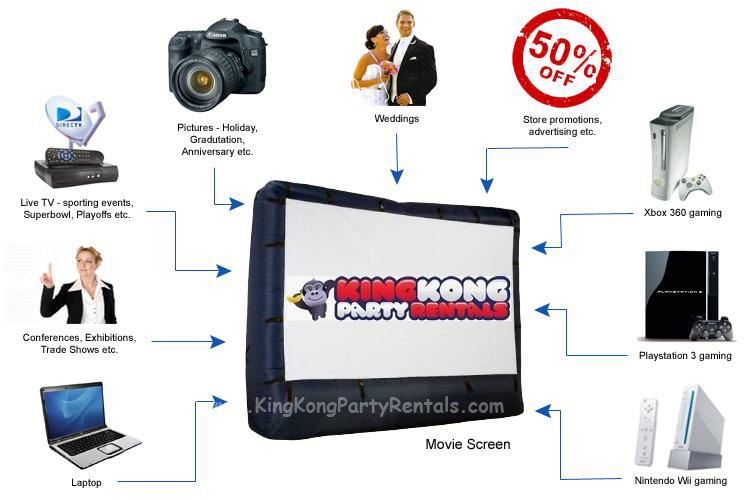 Choose KingKongPartyRentals to provide an inflatable Screen for your next event. 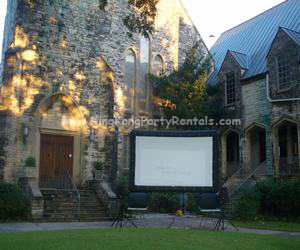 *Note – KingKongPartyRentals will only provide the equipment stated in our packages (Movie Screen, DVD player, Speakers, Projector) and not the entertainment or media. Any other equipment not stated in our package details such as DVDs, Videogame consoles, laptops, DIRECTV boxes etc. will not be provided. Any such items should be provided by the customer. Our projectors are VGA, S-video and AV cable compatible only. We endeavour to do our best to make a connection between the required equipment and the Movie Screen/Projector but this cannot be guaranteed. What do I get with each Outdoor Cinema package? Along with the Movie Screen itself we will also provide a Projector, Speaker System and a DVD player. All you need to provide is the content. This could be a DVD movie, a videogame system, or even TV cable so you can watch live sports! Who performs the installation of the equipment? All equipment delivered as part of the Movie Screen rental will be set up by our staff as part of the delivery service (similarly we will also dismantle everything for you upon collection). You will not be required to do anything other than instruct us where you would like the screen to be positioned and which way you would like it to be facing.